A couple weeks ago I finally picked up a copy of Aimee Ray’s Doodle Stitching. 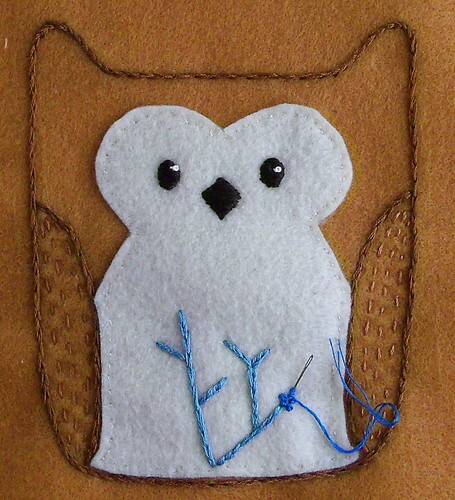 What with my sudden bird obsession and all, I decided to try the owl softie project. I’ve made one or two knitted softies, but I’ve never sewn any. Recently &Stitches did a series of posts on satin stitch, and this one has a suggestion for making circles come out right. I tried it, and it worked out pretty well. They’re not perfect, but they’re the best embroidered circles I’ve done so far. Now I just need to finish up the embroidery, then cut out the pieces, sew it up and stuff it. 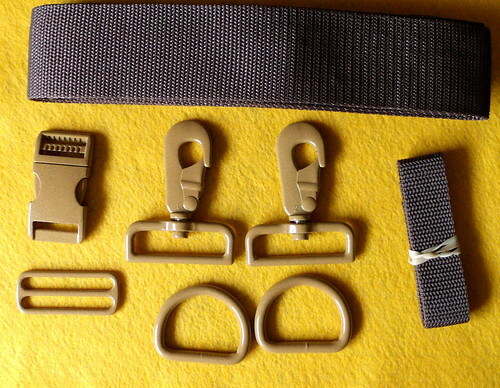 Today the hardware for the man purse came, so I can get on with that project. Can I rave about Strapworks for a bit? (I promise they’re not paying me to say nice things about them. For that matter I’m pretty sure no one would offer me money to promote anything in my teenytiny blog.) I’ve ordered from them twice so far, and both times I’ve been amazed at the great prices and fast service. 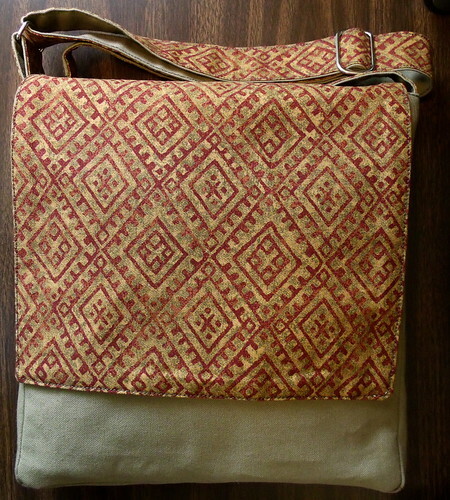 The first time, I was ordering hardware for this messenger bag, which predates the blog, so I don’t think I ever wrote about it here. I love this bag to death — it’s been my main purse ever since I finished it. The pattern is on Craftsy here: Walter+Veronica messenger bag and I think it’s also available from Etsy. I’m pretty thrilled with how it came out. I don’t know yet how well the powder coating holds up since this is my first time using it — I’ll try to remember to take a picture after a few months of use. I think it’s possible that the snap hooks (they’re to make the strap detachable) might scuff up the coating on the D-rings after a while, so I’ll just have to wait and see.